Luke has returned. He came; he saw; he conquered. And the first thing he did when he got home? A prolonged visit to the bathroom. Phil drove up about eleven o'clock this morning with three very tired boys (Luke, Andrew and Grant). Though he was tired, Luke did say that he had a great week at camp. He especially liked shooting the BB guns and archery. He also really liked the food and enjoyed the swimming and campfire rituals (timeless BSA skit stuff). Luke's target from the BB shooting was amazing. He is quite the marksman. At 50 feet, he had a very tight cluster almost completely in the bullseye. 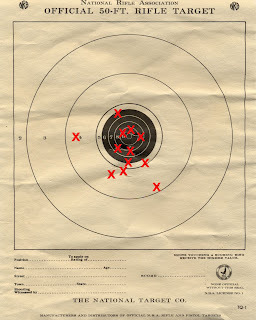 I've created an annotated version, because the little holes are hard to see, but he had eight of twelve shots in the center and the others weren't too far off from there! Now that he's back, he and Andrew are downstairs rotting their brains, catching up on some very sorely missed video games. Welcome home Luke! It sounds like you really enjoyed camp. I can't believe you even liked the food - what did they serve,- buttered penne's, pizza & chicken nuggets. Congratulations on yoru marksman abilities. Never know when that will come in handy!